WASHINGTON, D.C. – Today, Campaign for Accountability (“CfA”), a nonprofit watchdog group focused on public accountability, renewed its request to Nevada Attorney General Adam Laxalt to investigate rooftop solar companies – specifically Vivint Solar – after a local media outlet uncovered evidence that Vivint is continuing to victimize Nevada consumers. CfA previously called on Attorney General Laxalt to investigate Vivint Solar and other rooftop solar companies in April, after New Mexico Attorney General Hector Balderas filed a lawsuit against Vivint alleging systematic fraud, deceptive business practices, and racketeering. On September 7, 2018, the Las Vegas affiliate of ABC, KTNV, reported that a Vivint salesperson had distributed misleading fliers to consumers’ homes in the Las Vegas area. 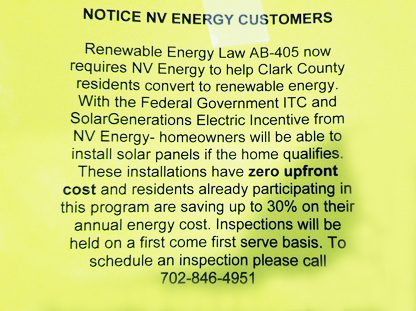 These bright yellow fliers claimed that a new law required the local utility company, NV Energy, to help residents convert to renewable energy. Although the flier looked like it had been distributed by NV Energy, the phone number actually belonged to a Vivint Solar salesperson. Click here to view a copy of the flier. The Vivint salesperson told KTNV that he partnered with NV Energy, but the utility company pushed back, saying “they do not partner with any solar contractor” and they do not sell any services door-to-door. Vivint denied its employees were involved. Vivint also appears to have made unauthorized credit inquiries. On September 20, 2018, KTNV reported that a woman who found one of the yellow fliers in her mailbox called and met with a Vivint salesperson and provided her husband’s social security number in relation to financing options. The man’s credit score plummeted after Vivint submitted several requests to credit agencies for the score. When the customer attempted to question the Vivint salesperson about the issue, he disappeared. By falsely representing that it’s fliers were distributed by NV Energy, Vivint appears to have violated the Nevada Deceptive Trade Practices Act, which prohibits businesses or individuals from making false representations about the sale of goods or services. In addition, by leaving the fliers in mailboxes, Vivint appears to have violated federal law prohibiting depositing any mailable matter, including circulars, in mailboxes used by the Postal Service. CfA, which first began investigating rooftop solar companies in the fall of 2016, released a report in December 2017 showing that consumers have filed more complaints against Vivint Solar and its competitor SolarCity than any other rooftop solar companies. Other states are now starting to take notice of Vivint’s deceptive business practices. In addition to the New Mexico Attorney General’s lawsuit, after Vivint took advantage of Spanish speaking customers, a California superior court judge issued an injunction requiring the company to write contracts to be in the same language they used to make a sale to a customer.